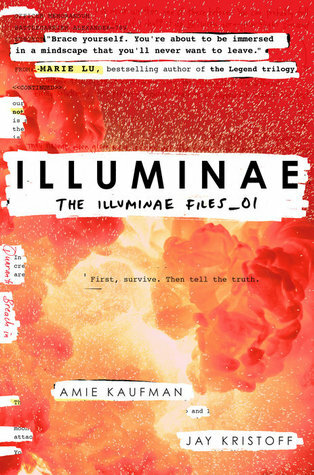 Illuminae by Jay Kristoff and Amie Kaufman. Knopf Books for Young Readers, 2015. Hardcover/Hardback. 599 pages. I genuinely don't know how to start this review because there are just so many thoughts racing through my head about this book, but I will do my best. I've seen Illuminae around the book community for what feels like ages now, even though it just came out last year, and now that I've read it I'm also mad at myself for not picking it up earlier. I think it was mainly because I'm not normally that interested in futuristic worlds or high school romance (which, by the way, is not an adequate classification for Illuminae). Illuminae basically follows the story of Kady Grant and Ezra Mason as their planet is invaded and those remaining from the attack must battle for their lives. Oh yeah, and a horrible plague has broken out that essentially makes people violent and crazy. This book is made up of classified documents, IMs, surveillance footage transcripts, and transcripts from crew members. First off, it's just utterly brilliant. I love novels that try to break through the binds of traditional presentation and do something different, but it's often heard to achieve without coming across overly cliche'd or try-hard. Fortunately, Illuminae is one of the few that pulls off this feat remarkably well and thus created a truly breathtaking story as a result. The only other book that comes close to invoking somewhat similar feelings as Illuminae by using unconventional formats and typography is Mark Z. Danielewski's House of Leaves, and even then there is still much difference between the two books. This book took me on such a roller coaster of a ride that I feel like I'm still feeling the aftereffects. The characters are all absolutely brilliant, which I'll admit was something I worried about due to the setup of the book; I wasn't sure if it allowed for the development of many characters. Well, I was needlessly worried. I fell in love with Kady and Ezra, as well as a few of the minor characters that we are introduced to as well. Everyone is so animated and each character has a strong, exciting personality that makes it hard not to become fully engaged with each one. I thought the romance element would bother me, but it was surprisingly entertaining and didn't drive me completely crazy; I instead enjoyed watching the growth and the strong bond that lay between them despite their past and current situation. I'm also very intrigued by Ezra's mysterious family and I'm hoping Gemina delves into that whole situation more deeply, which I assume it will. I also really liked exploring the theme of artificial intelligence and the potential impacts it can have upon a society when things don't always go according to plan. I feel like that entire aspect of Illuminae brings up so many great potential discussion points that really need to be had. In order to make sure this stays spoiler-free, I'm going to leave much of the rest of my analysis of the plot out because this is definitely a book that thrives on the element of surprise and the unexpected. Side note: I loved the shout-outs to various authors and such. When I came across the casualty list, I thought 'I bet the author's names are in there' - and yep, they were! There is also a movie poster at one point, and more fun authors names can be found there as well. So very clever - I love little easter egg type things. I really need to go buy this book - I've heard so many good things about it. I'm glad to hear you really enjoyed it. And those author shout outs so fab - I love when books do things like that. :) Thanks for sharing. This was definitely one of my top books of 2015, and I cannot wait for Gemina! They ran a contest to have readers' names on the casualty lists and they're announcing them today--so fun! I know, I actually feel somewhat relieved that I read it so close to the release of Gemina! And that is seriously so fun, such an awesome way to show you care about your readers! There is so much hype over this book that I'm seriously considering to get myself a copy, just to be on the loop. The blurb still doesn't grab my attention, but I guess I feel like you before reading it-unsure of how it works. So maybe I'll end up loving it like you!